I’ve always envied people that were really into watching sports. I would love to care about something (other than nerdy television shows and movie villains) enough to paint my face, don a kooky costume and brave the cold, just to prove my commitment and loyalty. To feel the agony of defeat in the hopes of, one day, just maybe, getting to experience the glory of ultimate victory. But nope. Just don’t give a toss. Matt either (with the exception of the occasional World Cup match, of course). This is Matt and me watching the news when the sports headlines come on. SPORTSCASTER [Very excited]: AND THE STEELERS SCORED AN AMAZING SEVENTEEN AND FIFTY-SIX YARD PASSES LESS THAN SIX MINUTES APART IN THE FOURTH QUARTER! UNBELIEVABLE!!!!! MATT [Pops a chip in his mouth]: Shove ha’penny? EMILY [Rolls eyes]: Quoits, idiot. I kind of want to watch the Super Bowl sometime with our sporty friends just to see what it’s all about but I’m afraid their heads would explode with all the dumb questions I would ask. Examples; Why are they stopping? Is that guy mad, because he looks mad. What do those numbers mean? Why did they get all those points if the just scored a base goal once? Why are they stopping again? Is there any more beer? But the one sport watching ritual I can totally get behind? Snacks for dinner. That, my friends, is living the dream. 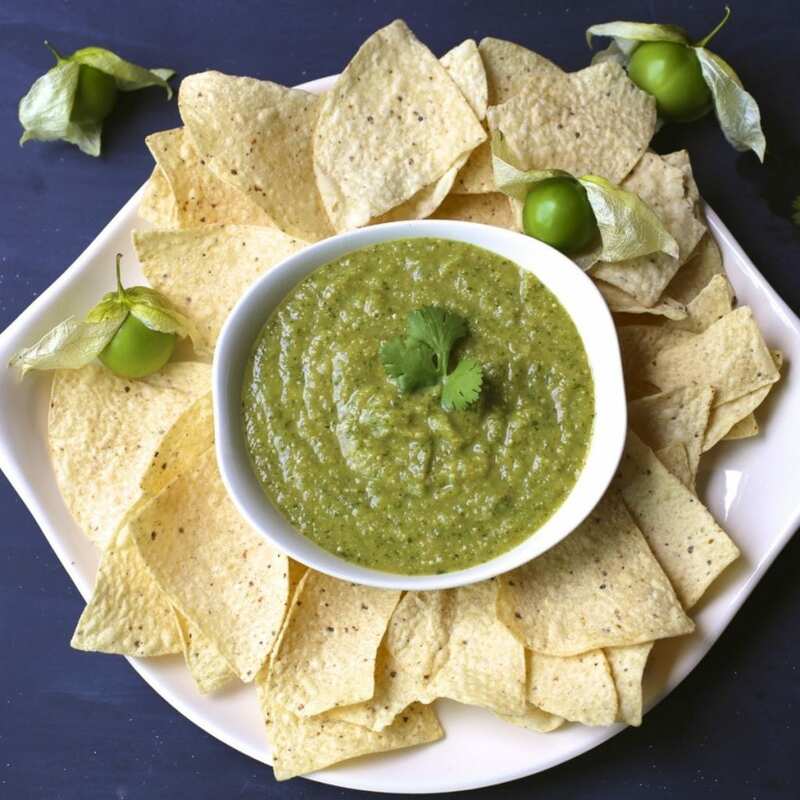 Speaking of dreams, this Roasted Tomatillo Salsa Verde is super easy to make. 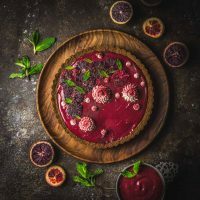 I’m also giving you the recipe for two versions. The first is pretty much the classic salsa verde, (which is delicious and has the added benefit of being vegan*). 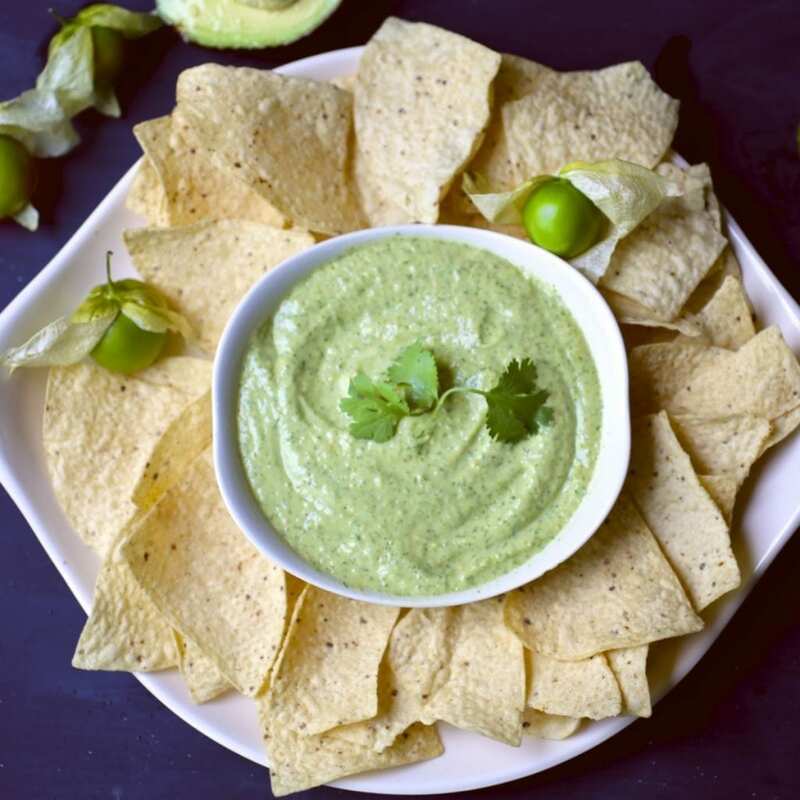 The other version adds a creamy element to the original, with the addition of ripe avocado and a little bit of sour cream. It’s almost like a smooth, creamy guacamole. So, so good. 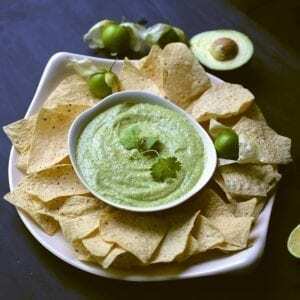 *For a creamy vegan version, add the avocado but leave out the sour cream. Serve either version just with tortilla chips or on top of nachos. It would be delicious as a sauce on grilled or roasted chicken or shrimp. 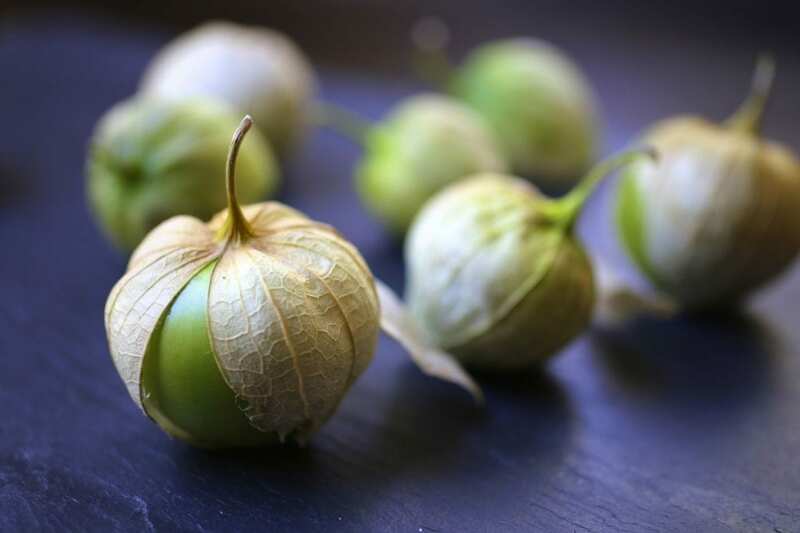 Tomatillos look like green tomatoes but they’re actually more closely related to gooseberries. They have a tart, almost citrusy flavor. 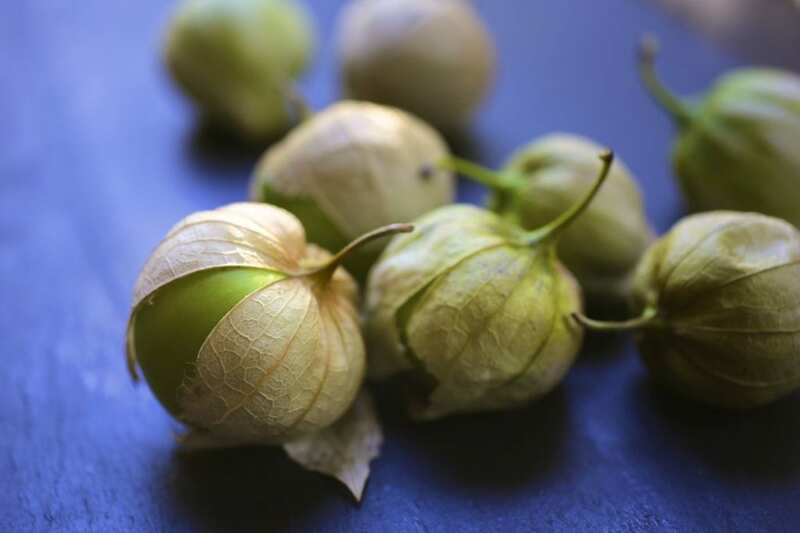 They grow inside a husk that turns papery and brown when they tomatillos are ripe. Added Nerd points: we grew these ourselves! The husks have to be removed before preparing, You can wash the fruit with soap and water to remove the sticky film on the fruit. 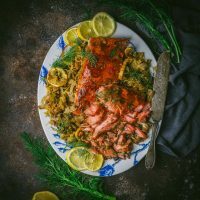 Toss onion, (quartered lengthwise, with root intact), garlic cloves, chiles, tomatillos, with 1 tablespoon vegetable oil in a large bowl. 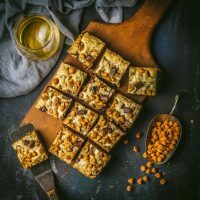 Pour vegetables onto a foil lined baking sheet and spread into a single layer. 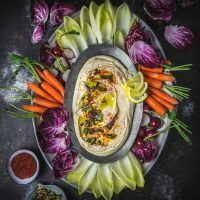 TIP: Keep smaller vegetables (like the garlic cloves) towards the center of the tray where they are less likely to burn. Roast vegetables, turning once, until tender and charred, 15-20 minutes. Remove from oven and let cool slightly. Once vegetables are cool enough to handle, transfer all the roasted vegetables (along with any juice collected on the baking sheet) and the cilantro into a food processor. If you like chunky salsa, pulse 4 or 5 times. For a smoother sauce, process longer (30-45 seconds); season with kosher salt, freshly ground black pepper, to taste. DO AHEAD: Salsa verde can be made 5 days ahead. Cover and chill. 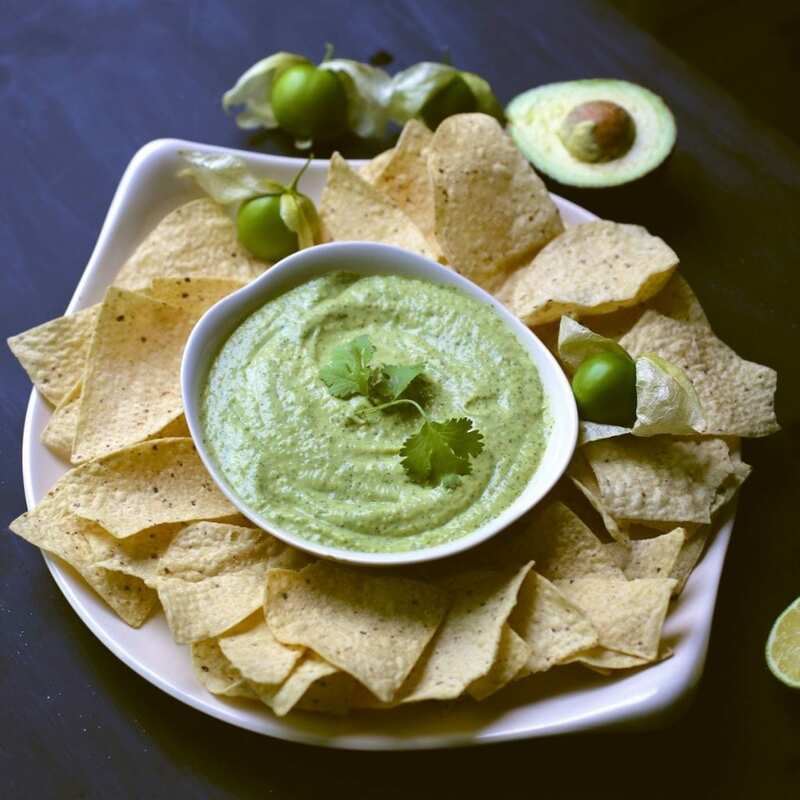 CREAMY VARIATION: Add ½ cup sour cream, 2 tablespoons lime juice, and the flesh of 1 ripe Haas avocado to the processor. Process until smooth and creamy. This salsa looks seriously delicious. 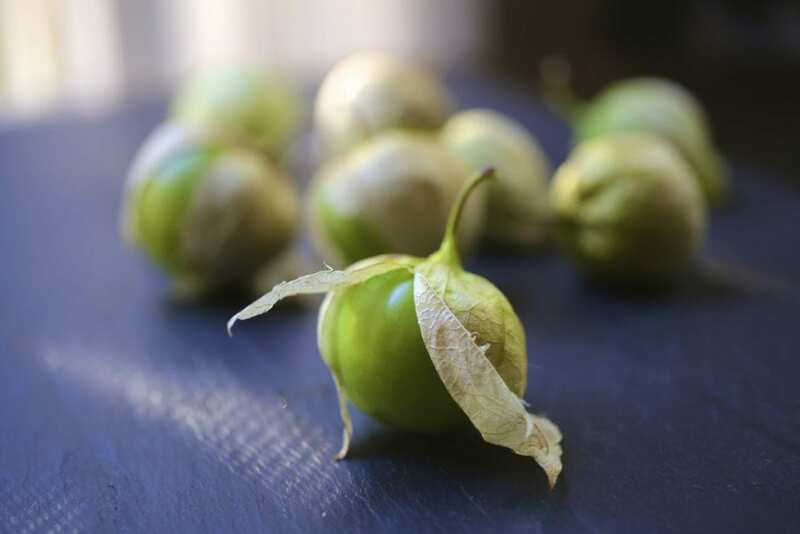 Definitely need to get my hands on some tomatillo’s so I can make the recipe – thanks for sharing it! Just made this as an alternative sauce for enchiladas, the salsa turned out awesome and we are about to try it with the enchiladas. Thanks for the recipe and just to give you another little boost, we live in Central Mexico and my wife, who is Mexican said it is an amazing salsa. We’re so glad you both enjoyed it! It’s doubly great to get approval from someone who’s had the authentic version!